It-Blocks in the Media, Again! 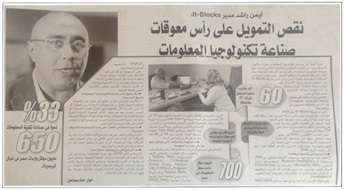 In his Interview with Alqarar Almasry Journal; Ayman Rashed - It-Blocks CEO - has asserted a lot of the outlines in regards to the IT demand reduction that Egypt is suffering. Rashed claimed that the lack of funding was the main success constraint for the information technology industry in Egypt. Ayman also said that unqualified graduates are crippling the IT Industry. when asked about the reason does the market have reduced demand for Egyptian software, Ayman said that this comes relevant to the scarcity of awareness and sensibility of the company owners about their products and how much could accomplished with their features. Eng. Ayman also went on to talk about IT-Blocks starting point as a software company and how the business success story went from owning one branch to owning a four branches company with one branch in KSA and around 120+ employees in total.